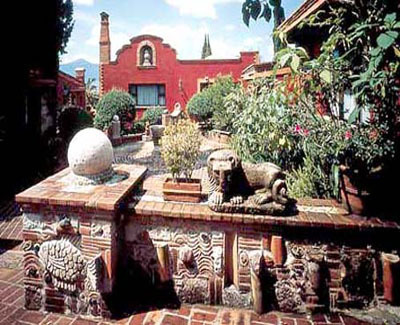 Nestled in the Santa Maria hills just five minutes from the heart of Morelia, this colonial jewel reflects centuries . . .
Nestled in the Santa Maria hills just five minutes from the heart of Morelia, this colonial jewel reflects centuries of rich Mexican heritage. Set amid luxuriant gardens of statues and stonework, this hilltop estate contains 36 cottage-like accommodations, no two alike. Lodgings feature patios with panoramic views, cozy fireplaces, and decorative blends of antiques, regional handcrafts, and folk art. Enjoy indoor and outdoor dining by award-winning chefs, romantic trio music, nearby dining and shopping in Morelia, and scenic excursions to the Indian village of Patzcuaro.